Whisk together olive oil, garlic, soy sauce, and brown sugar. Pour into a zip lock bag and add shrimp. Seal bag and toss to coat. Allow to marinated in fridge for 30 minutes before preparing dish or overnight. Prepare penne noodles according to the package instructions. Drain marinade and add shrimp to a large preheated pan or skillet. Saute over medium high heat 3-4 minutes until shrimp have turned pink. Add red pepper flakes, shredded parmesan cheese, grated parmesan cheese topping, and cooked noodles. 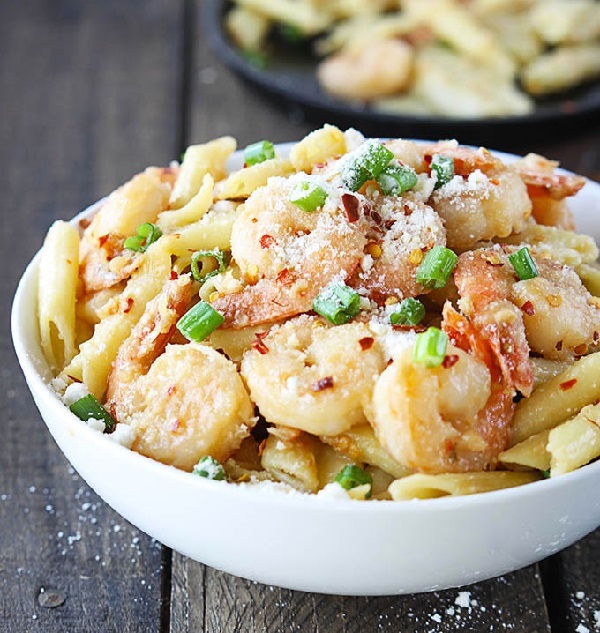 Cook 3-4 minutes longer stirring throughout until shrimp and noodles are coated with cheese. Season with salt and pepper to taste. Garnish with sliced green onions if desired.